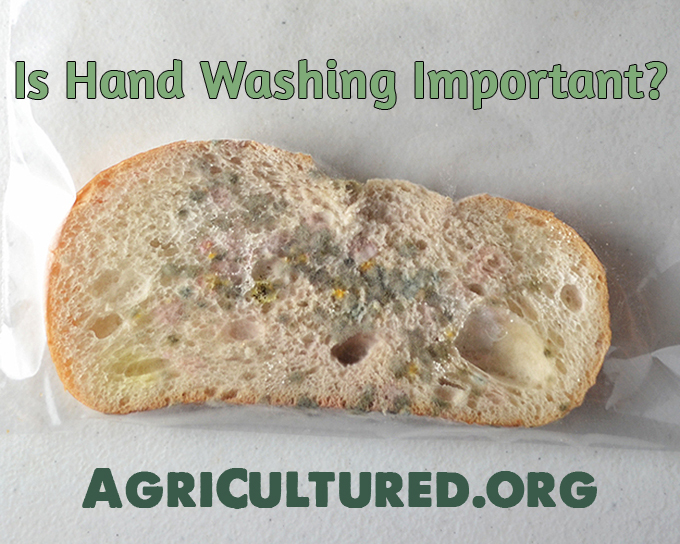 You are here: Home / About Farming & Food / Is Hand Washing Important? You wash your hands to get dirt and bacteria off. When your hands don’t look dirty, it’s easy to forget about the bacteria you can’t see that can make you sick. This experiment will help you visualize how many bacteria can be on your hands, and why hand washing is so important. The whole point of washing your hands is to get rid of dirt and bacteria that could make you sick. It’s easy (usually) to see dirt on your hands. When they look dirty, it’s time to wash them. But what about when your hands don’t look dirty? We can’t see bacteria, so it’s hard to visualize how many bacteria there are (or could be) on your hands. And that makes it hard to really understand why washing your hands is so important. A loaf of white bread. Bread with no preservatives (from the bakery section of your grocery store) works best for this experiment, but regular off-the-shelf white bread will still get the job done. It just may take longer to see any results. Water in a spray bottle. Next, take another slice of bread out and touch it with your bare hands. 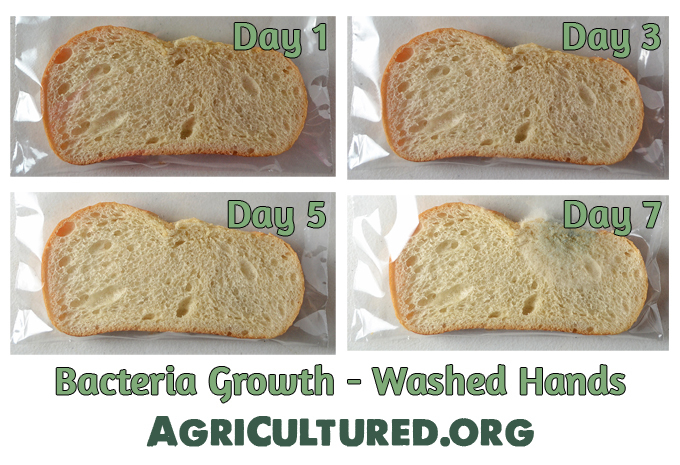 Put the bread inside a new Ziploc bag, spray it with two sprays of water, seal the bag, and label it “touched.” Then wash your hands, and do the same thing with a fresh piece of bread. 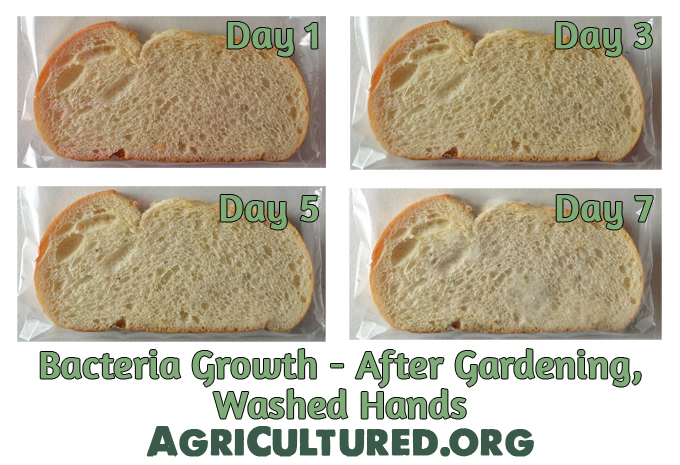 Label it “washed hands.” If you have kids, let them have their own bread and do the experiment with you! 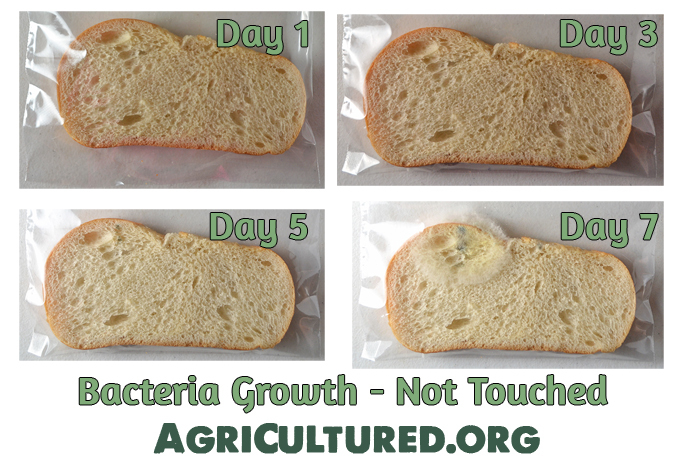 Over the next 5-7 days (a few days longer if you used bread with preservatives), you should see bacteria start to grow on your bread. Bacteria colonies will look like white, black, gray, green, yellow, or even red spots on the bread. Some of them might be fuzzy and some might look smooth. Different types of bacteria will look different as they grow. You can see that there is some black bacteria and some fuzzy white bacteria growing at the top left of this bread. That’s where I touched it with the tongs, and it means that I should wash my tongs! Yuck, right! Lots of bacteria are growing there – green, black, yellow, some even look pink. They are everywhere! Then I washed my hands, using the recommendations from the Centers for Disease Control and Prevention, and did the same thing with a new piece of bread. 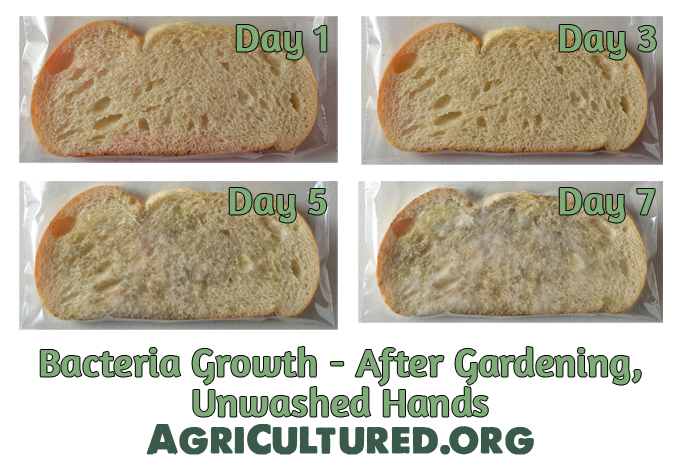 There are still some bacteria growing on the bread, but not nearly as many as before I washed my hands! Washing my hands got rid of a lot of the bacteria that I had “picked up” just doing my normal morning routine. This is why you should always wash your fruits and vegetables before you eat them. 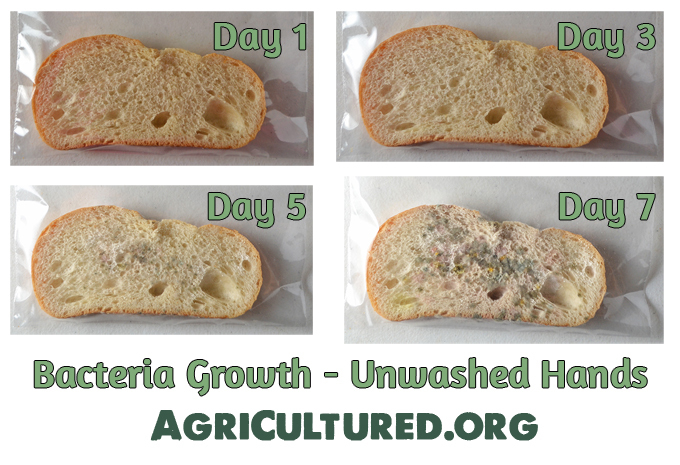 So many bacteria grew on this bread! All I did was pick tomatoes from our garden. I didn’t dig in the dirt, I didn’t plant anything new, I didn’t fertilize. Just pulling tomatoes off the plants. Granted, we have 25 tomato plants, but still. This was a lot of bacteria! After I washed my hands, there were still some bacteria there, but not nearly as many. Washing your hands – with soap and warm water – helps to remove dirt and bacteria from your hands. Just like I transferred bacteria from my hands to this bread, you can transfer bacteria from your hands to your eyes, nose, and mouth, and to anything else you touch. (This is also why you should think twice about using the Five-Second Rule.) Washing your hands on a regular basis can help to keep you, and everyone you come in contact with, healthy. Clearly hand washing is important. But what about hand sanitizer? Isn’t that a perfectly acceptable alternative to washing hands? And isn’t using hand sanitizer maybe better than hand washing? Read about hand sanitizer in this article on The Real Farmwives of America & Friends.